It wasn’t enough to force him to resign from the Dayton Public School board by threatening a lawsuit to have him removed for non-residency. It’s not been enough to show that he has ties to all kinds of people who have been involved in shady lobbying, and gotten a large amount of foreign cash delivered into one of his unreported shell companies. It’s not enough to flat out call him out as committing voter fraud. Or watching him do deals with the school board that he had no business being involved in because of conflicts of interest (the CareSource Deal and the Bus deal). The guy keeps coming back to politics, and now wants to be your Montgomery county recorder. Only a sock puppet has 5 twitter accounts. That’s the last thing you want to do for a guy with Russian ties (and not the kind you wear around your neck) and 5 twitter accounts. *Optional boards established by the County Commissioners in accordance with state law. Description Traverse Legal, PLC, represents the copyright holder, Adil Baguirov and is his authorized representative to send copyright infringement notices on his behalf. Mr. Baguirov owns registered copyrights to the him with the Azerbaijan President while wearing a pinstripe suit and peach colored tie. US Copyright Registration No.1-6815915145. The copyright rights to this photo were assigned to Mr. Baguirov by the photographer, Samir Huseynov, on July 12, 2018. Description Traverse Legal, PLC, represents the copyright holder, Adil Baguirov, and is the authorized representative to send copyright infringement notices on his behalf. Mr. Baguirov owns registered copyright to the photo of him protesting while holding a sign that says “Stop Military Aid to the Aggressor.” US Copyright Registration No. 1-6776099511. The copyright rights to this photo were assigned to Mr. Baguirov by the photographer, Yusif Babanli, on July 10, 2018. Description Traverse Legal, PLC, represents the copyright holder, Adil Baguirov and is the authorized representative to send copyright infringement notices on his behalf. Mr. Baguirov owns registered copyrights to his headshot, wearing a red tie. US Copyright Registration No. 1-6761676854. The copyright rights to this photo were assigned to Mr. Baguirov by the photographer, Sevin Baguirov, on July 11, 2018. Weldon and Giuliani are not Baguirov’s only connections to the #TrumpRussia scandal. Baguirov also went to Trump University, and claimed “I’ve attended a lot of these seminars and Trump’s was above average,” says Adil Bagirov, an energy consultant in Alexandria, Va. “It wasn’t the most effective, but I learned some things, and I’ve been very successful,” he says. Why would Baguirov attend Trump University if he has a Ph.D from Moscow State Institute of International Relations (MGiMO), a university notorious for being the recruiting ground for the FSB? You might also want to look at all his political donations he used to make when he was working for all the shady type lobbyists before he came to Dayton. Let’s look at who is funding him now? 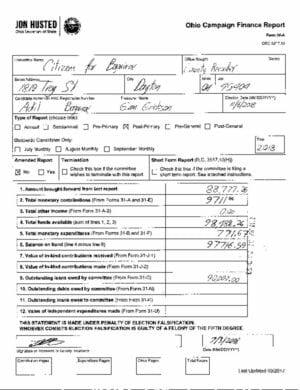 Mostly himself, with a $90K loan, but a lot of his donors are from out of state. Considering we showed how many things he failed to list on his Ohio Ethics Statement way back– and there has been no public accounting for the offshore money deposited into his Turbillion shell company, how anyone can trust anything that comes out of his mouth- or he turns in as a campaign finance report, is beyond comprehension. Do us all a favor Dayton, and vote for Brandon McClain for County Recorder. Our “International Man of Mystery” needs to go away. “So it was a bit awkward when Azerbaijan’s election authorities released vote results – a full day before voting had even started. I can see why Baguirov is a bit nervous about photos of him with Aliyev, a man obviously enmeshed in all manner of corruption. 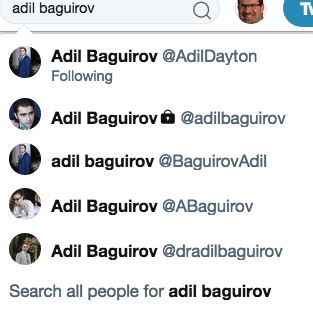 Does Adil Baguirov have no shame? Manchurian Candidate, money launderer for the Russian Mob, or both? He’s lending himself $90k to win a $70-80k/year job? Is the recorder an office you can run part time so that he can run to DC to lobby for Azerbaijan still? Nothing about this guy passes the smell test.